Buy 315MHZ RF RECEIVER Online at LOW PRICE in India. Great prices with fast delivery. ORDER NOW!!! The 315 MHz RF Receiver is ideal for short-range remote control applications where cost is a primary concern. 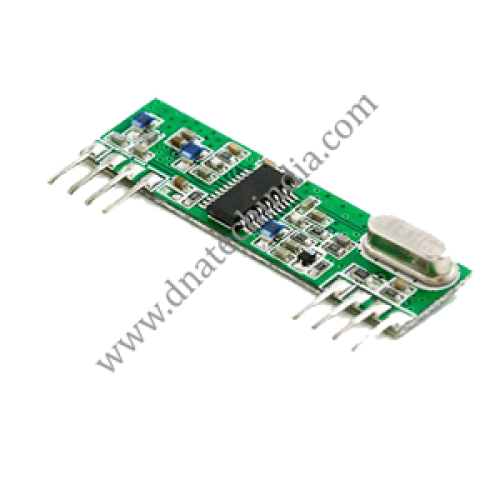 The RF Receiver can be used to receive RF signal from transmitter at the specific frequency which determined by the product specifications.The receiver module requires no external RF components except for the antenna. It generates virtually no emissions, making FCC and ETSI approvals easy. • Industrial remote control, telemetry and remote sensing. • Alarm systems and wireless reception for various types of low-rate digital signal. • Remote control for various types of household appliances and electronics projects.